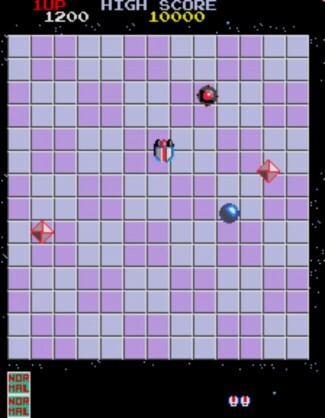 The object of the game is to bump your enemies – space bugs – off the solar base using Motos, your ship. When you bump all of them off, you move to the next base or round. If Motos is knocked off the base, you lose one life. The game is over when you lose all your lives. You can collect Power parts and Jump parts lying on the solar base by simply having Motos touch them. The collected parts will be displayed in the lower left corner of the screen and you can use them in the next round. Motos can be outfitted with no more than seven power parts; the more power parts added, the more powerful Motos is. However, Motos can only be outfitted with only one jump part per round. With a jump part, Motos can jump over two squares by moving the joystick in the desired direction and pressing the Jump button. One jump on a square cracks the square and a second jump in the same spot makes a hole in the solar base. You can outfit Motos with these parts in the Power Parts or Jump Parts screen displayed at the beginning of each round. Select the number of parts you want by moving left and right with the joystick, and lock them in place by pressing the Jump button. You can use the selected parts for one round only; they will not be available in subsequent rounds. Linger too long on the playing field and Shooting Stars will begin to fall periodically onto the solar base. The Stars are aimed at Motos, and when they miss they crack a square or break a hole in the solar base (like they do to the base behind the Motos logo in the attract mode’s title sequence). * Motos – The protagonist of the game. This is you. * Power Parts – These give Motos extra bumping power. Motos can be equipped with a maximum of seven Power parts at a time. * Jump Parts – These give Motos the ability to jump over the gaps in the playfield. Motos can only be equipped with one jump part at a time. * Red Pupa (First appears in Round 1) – Weighs in at 380 kg (838 lbs) and travels 20 km/h (12.4 mph). * Blue Pupa (First appears in Round 2) – Weighs in at 380 kg (838 lbs) and travels 20 km/h (12.4 mph). * Polar (First appears in Round 2) – Weighs in at 400 kg (882 lbs) and travels 20 km/h (12.4 mph). * Spirus (First appears in Round 4) – Weighs in at 2,900 kg (3.2 tons) and travels at 40 km/h (24.9 mph). * Fire Bug (First appears in Round 7) – Weighs in at 3,800 kg (4.2 tons) and travels at 45 km/h (28.0 mph). * Mega (First appears in Round 9) – Weighs in at 7,500 kg (8.3 tons) and travels at 10 km/h (6.2 mph). * Taitorian (First appears in Round 11) – Weighs in at 4,100 kg (4.5 tons) and travels at 55 km/h (34.2 mph). * Fire Bee (First appears in Round 13) – Weighs in at 3,200 kg (3.5 tons) and travels at 70 km/h (43.5 mph). * Lady Bug (First appears in Round 17) – Weighs in at 5,120 kg (5.6 tons) and travels at 60 km/h (37.3 mph). * Black Pupa (First appears in Round 18) – Weighs in at 400 kg (882 lbs) and travels 20 km/h (12.4 mph). * Beetle (First appears in Round 18) – Weighs in at 5,800 kg (6.4 tons) and travels at 55 km/h (34.2 mph). * Giga (First appears in Round 29) – The heaviest of all enemies. Weighs in at 13,400 kg (14.8 tons) and travels at 20 km/h (12.4 mph). * Beecon (First appears in Round 2) – Scores you points whether Motos or an enemy bug bumps it off the solar base. * Nabicon (First appears in Round 3) – Most of these unleash Blue Pupa at regular intervals. * Shooting Stars – They fall periodically onto the solar base if you take too much time in a round. They are aimed at Motos and when they miss, they crack square or break a hole in the solar base.